Humanitarian Bruno Serato’s charity, Caterina’s Club, known worldwide for feeding some 25,000 hungry children each week, finding permanent housing for underprivileged families and helping at-risk youth avert gang life through his Hospitality Academy, will be the beneficiary of the American Foundation of Savoy Orders white- and black-tie gala fundraiser on Saturday, April 6 at the Montage Resort in Beverly Hills. His Royal Highness Prince Emanuele Filiberto di Savoia, Prince of Venice and Prince of Piedmont, Italy, will be the guest of honor at the festivities that will include a cocktail meet-and-greet, followed by dinner in the hotel’s Marquesa Ballroom, then an after party on the Rooftop Conservatory. The public may purchase tickets for $750 each. Visit https://www.savoydelegation-usa.org/notte-di-savoia.html#/ to book tickets and tables, or to make a contribution to the cause. The House of Savoy is the Italian Royal Family whose origins began in the year 1003, in the small alpine region where today Italy borders France. Through gradual expansion, the Savoy Dynasty grew in power to eventually rule the Kingdom of Italy until 1946 when, in the aftermath of World War II, the monarchy was replaced by the Italian Republic. 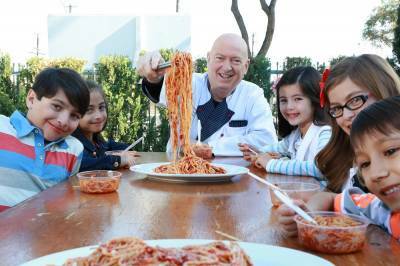 Caterina’s Club serves pasta each night in 89 locations in Orange and Los Angeles Counties, with more than 2.9 million meals served to date. Bruno’s influence extends far beyond the Southern California area to include Chicago, New York, Texas, Mexico and Italy.